This guide will explain the important methods/API's of Spring BeanFactory interface with examples. The BeanFactory is the root interface for accessing a Spring bean container. This interface is implemented by objects that hold a number of bean definitions, each uniquely identified by a String name. 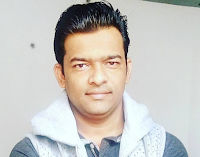 Normally a BeanFactory will load bean definitions stored in a configuration source (such as an XML document), and use the org.springframework.beans package to configure the beans. 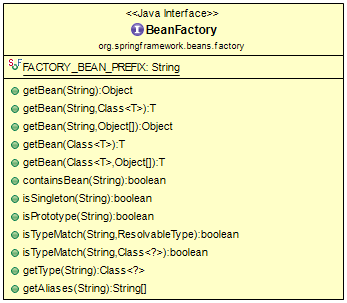 You can find all BeanFactory interface methods at https://docs.spring.io/spring-framework/docs/current/javadoc-api/org/springframework/beans/factory/BeanFactory.html. // Return the bean instance that uniquely matches the given object type, if any. // Determine the type of the bean with the given name. // singleton instance with the given name? // Is this bean a prototype? That is, will getBean always return independent instances? // Is this bean a shared singleton? That is, will getBean always return the same instance? // Return an instance, which may be shared or independent, of the specified bean.